Leaders should not underestimate the importance of Thinking Partners as they embark on new ways of learning and leading. As they continuously re-examine traditional leadership practices and test new mental models, leaders become vulnerable. Thinking Partners provides the structured reflection and safe means to evaluate leadership practices. As you think out loud, your partner will listen with intent and then pose questions to deepen your thinking and offer you new perspectives. Do you routinely include structured reflection in your work? Do you ask others for help in “thinking things through”? Do you look to others for new perspectives or to shift your thinking? Knowles, M. (1984). The Adult learner: A neglected species. Houston: Gulf Publishing Company. 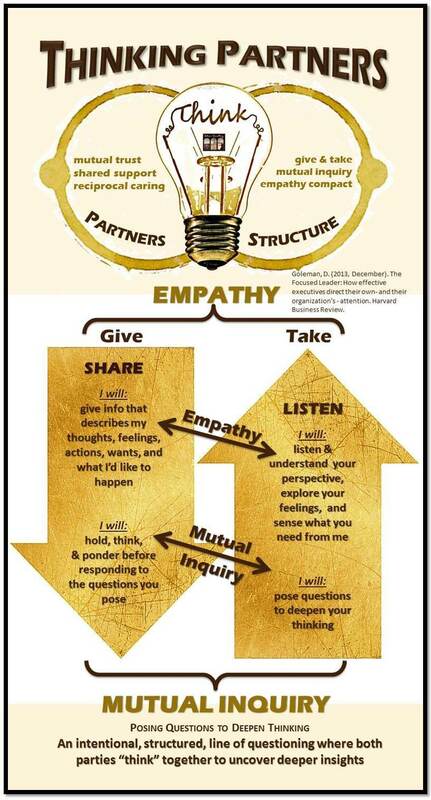 This entry was posted in Leadership and tagged compact, empathy, leader reflection, leadership, thinking partners. Bookmark the permalink.